The Tangye HTP manually operated, two speed hydraulic pumps are compatible with variety of fluids including water and oil. The pump’s two-stage piston design provides a high flow, low pressure stage, followed by a smooth manual changeover from low to high pressure output. The Tangye HTP pump has a multi-positional, operating lever for ease of operation. All HTP pumps feature a factory pre-set relief valve, providing additional safety. The Tangye HTP is available in seven pressure capacities ranging from 110 Bar to 1,000 Bar. 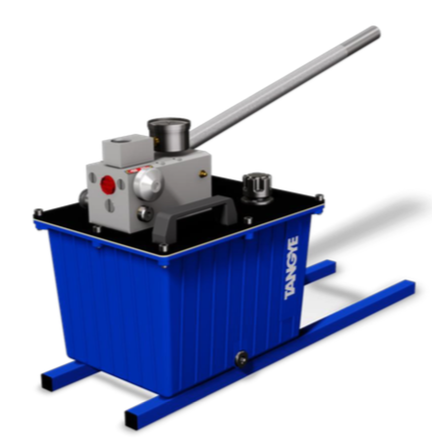 The pumps can be readily customised to suit the application through a choice of pressure gauge kits and hoses. The Tangye HTP is part of the Tangye range of high performance, hydraulic lifting jacks and pumps, designed and manufactured exclusively by Allspeeds Ltd in the UK.